How does the artist’s style align with your own? When choosing who will create your wedding cake, think of the theme and décor you will have for your wedding. Just like with photographers, florists, and other vendors, choose your cake artist with style in mind. Take their aesthetic into consideration and see if their overall work style will mirror your own. When an artist creates a particular style they become known for, they are more inclined to be excited about the event piece, which will show in the final product! When both brides and vendors are excited to work together, it will be visible when everything comes together on the wedding day. Is the person taking your order the same who will do the hands-on decorating? This is SUPER important to think about… If you’re going to a bakery with a full staff, ask what the process entails and if there is a designated person to create your cake. When there’s a chain of command or multiple people working on one project, i.e. : different person who takes meetings, runs the office, bakes, decorates, and delivers, having a sketch on file with your artist will streamline the production of your wedding cake. As with anything else style related: does this reflect your personal style? I love when couples envision a cake and event styling that shows their personality to their guests. 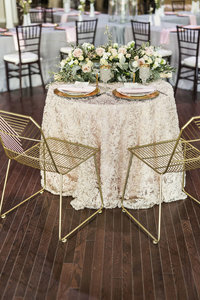 On the other hand, some couples tend to design their wedding opposite of what they would normally have in everyday décor/style. The same applies to your wedding cake: if you want a piece that is completely out of your norm, it’s a fun way to shine. One of my more recent couples were self-proclaimed geeks and love everything about Harry Potter, so they chose to create an entire wizarding world for their event right down to the table décor and cakes. Elements were incorporated to the main cake to make it both fun while staying elegant, and the second cake was all out fun and whimsical. Are you planning to have every tier a different flavor? This one I love. So many couples cannot agree on one or two flavors, or they are overwhelmed with flavor options and desire to have everything. This is GREAT for giving guests options, however, you may run into a small problem. When more options are given (especially with food), people are more inclined to sample everything. On the other hand, more guests taking more than one cake serving may leave you running out of cake. If your five tiered cake will have five different flavors, you can always choose the largest tier to have the most palette-friendly flavor, and leave the more complex or obscure flavors for the two of you. Think of it in terms of drinks at events: sodas usually have a dark and a light option, beers are usually limited to two or three brands, and wines usually have a red or white. You CAN have more than one flavor for guests, just be sure to consider these points when picking those decadent cakes! *If you choose multiple flavors or an option with tree nut ingredients, a photo frame with a printed list of flavor options or a notation that there are nuts in the cake(s) is great for guests with allergies to be included AND stay safe! Do you plan on having a custom piece designed or another image replicated? As a custom designer who focuses on unique cakes, this one hits home for sure! It’s so easy to get wrapped up in Pinterest when planning a wedding and being overwhelmed. While many couples do have a vision for their cake, discuss with your artist the specific elements you like when bringing in reference images for your design. This helps to create a truly unique and custom cake experience for each couple, while focusing on those specific touches that stand out to the clients. Now, I do realize that many of the “rustic” textured buttercream or naked cake styles can be difficult truly customize. There are definitely instances where couples have chosen a textured cake with a single finish throughout instead of having different tiers with various finishes. Don’t be afraid to think outside of the box and let your designer use that element of texture while still creating a cake just for YOU. Let your wedding be a time to bring out pieces of your own artistic style versus copying another image. If you’re stumped on where to start with a custom creation, create a list: have a column of elements that you dislike, and you may find yourself unknowingly creating the list of your likes at the same time. I’ve been in a consult where the couple had no specific desires or ideas, however, they knew exactly what they didn’t want. This was actually extremely helpful to define what they were leaning towards, sometimes it just helps to have a different approach to a solution. Be sure to use these tips as you are scheduling your cake tastings and stay tuned to for next week’s blog as we discuss flowers. Will you choose fresh or sugar flowers for your cake design? I’d like to thank Jenna, the owner of Sinfully Sweet for taking the time to give us insight into the cake world.